Here's just a small sampling of our projects. VirtJuice - Arroyo Grande. Expansion and remodel of smoothie and juice bar. Palo Mesa Pizza - Arroyo Grande. Expansion and interior tenant improvement of Palo Mesa Pizza #1. Mission Animal Hospital - San Luis Obispo. Interior remodel and expansion for Kevin Toman, DVM. Small Studio Office - Efficient and compact small offices ideal for a home office, storage shed or pool house. This remodel of an existing and well established restaurant in Pismo Beach focused on redefining the restaurant as a premier BBQ destination. Interior rendering of a remodeled restaurant in Pismo Beach, CA. Rendering by Jim Dummit. 2,500 square foot tasting and production facility, with an existing high end residence creating a destination getaway for the wine enthusiast. 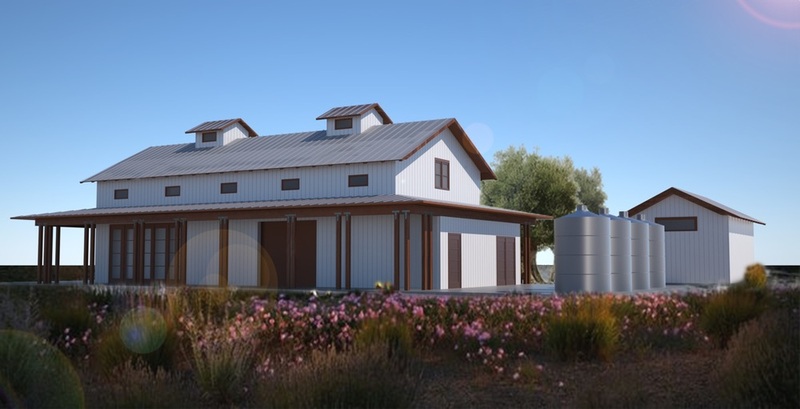 Wine Production and Tasting Facility - Edna Valley - San Luis Obispo, CA Rendering by Compass Property Group.